Santa Marta is a port town with a small colonial center, surrounded by a newer (read: same as everywhere else) town. The colonial heart isn’t very big but is quite nice. It is made up of two cross streets and is centered around Parque de Los Novios. This is also where you’ll find the hostels, the bars and the better (and more expensive) restaurants. If you decide to make your home here, then you’ll have access to most of the basic conveniences like nice cafes and decent food. Of course, the selection won’t be as extensive as in Cartagena four hours to the southwest by bus (or, I imagine Medellin). But then, Santa Marta is a small city, not a metropolis. Rodadero, which you can see in the main image of this article, is ten minutes by taxi south of Santa Marta (there are also buses all day long). It sprang up to cater to local tourists (and us, as this is where we made our home). It doesn’t have a colonial heart. It doesn’t, in fact, have much of a heart at all. There are no town squares or picturesque decors. I guess that’s what you get when you stamp a place out of the ground to part local tourists and their money. There are tons of restaurants but they pretty much all serve the local cuisine. The town’s idea of a bar is plastic chairs, TL tube lighting and blaring Latin American music. So if that’s your thing, you’ll love it here. Note that there is one decent café with internet, reasonable coffee and aircon. It’s called Alta Mar and it’s at Carrera 1 #5 – 113. The picture o the tables above is the outside. You can also work from the local version of Starbucks called Juan Valdez café. There is one in the mall and one in the town ‘center’. It isn’t all bad news. There are tons of apartments on offer, which you can rent per day or month. All you need to do is walk around and people will accost you (check out my apartment hunting guide for help with that). Another bonus is that the beach is nicer than Santa Marta. Though it does gets crowded on weekends and holidays. Also, the city is cheaper, which is a bonus if you’re on a budget. We stayed at local at a place called Villa del Mar. But they’ve also got massive apartment towers with nice pads and a view of the ocean if that’s what you’re into. We found a swanky modern furnished three-bedroom apartment with shared swimming pool, mini golf, gym and sauna for 900 US per month. That would have worked out well with more renters. The basics are all in place. Where we lived we had three different supermarkets chains ten minutes away by foot. There was also a mall. This meant we were able to cook to our heart’s content. There was even decent bread with a crunchy crust at the cheapest one called Ara. Yes, I know. Wonders never cease. For our coffee addiction, we got one of those bubble up stove top things. We bought it at the local coffee chain Juan Valdez, but we also saw it for sale in other places. This coupled with the strongest store-bought coffee makes for a great brew. The store-bought coffee here, unlike some other areas in Latin America, is great. You can buy coffee at the cafes, of course. But then one of two things will happen. Either, you’ll pay close to western prices or get something that – to paraphrase Douglas Adams – is almost, but not quite, entirely unlike coffee. It always amazes me how little Latin American cultures understand about coffee making, even in the heart of coffee country. Yeah, I know it’s ‘their’ coffee and I shouldn’t impose my Western values, but come on! What they make isn’t coffee! It’s hot sweet water where they’ve used coffee as a food colorant! If you’re willing to pay, then Santa Marta itself has some great coffee choices. The internet. We shared a ten-gig internet connection with two other apartments. We didn’t have to pay extra for it either. It was included in the price for the apartment along with water and electricity – all for 270 US a month! We found our place in Villa Del Mar, which was a bunch of little houses a bit back from the beach. It was about a 10-minute walk to my daily swim. We liked the surroundings. The people were friendly, there was lots of green and there were tons of happy children and animals frolicking about. Do note that not all the apartments there had an internet connection like that. Most use a far more basic option. So if you go apartment hunting, make sure you have the speed checking app loaded on your phone. It is free. Of course, that doesn’t only go for this area. Also, when you go apartment hunting make sure that you avoid doing so right before Colombian public holidays. That is unless you like it when apartments are hard to find and cost a fortune. We didn’t follow that advice, arrived just before Semana Santa and ended up struggling. Still, we were happy with what we found. It was basic, but it served our purpose. If you want to check it out, go to Villa Del Mar and try to get the attention of the woman that lives above A2 and A3 (both apartments are for rent). She’s a university student, so she won’t be in during the day. Note that the mattress is pretty crappy but the stove was good and the hammock in the living room was awesome. If you do take it, a kitten (or she could be a cat by the time you go) might wander in. She has a mustache and a goatee and her name is Pepita. Give her a big cuddle from us, because we miss her terribly. She was an affectionate ball of fur that wasn’t afraid of anything or anybody. She loved to chase her own tail, thought paper bags were god’s gift to cats, and never quite got that she couldn’t hide by crouching down on a white-tiled floor. It’s funny that after all these years of travel it has been a cat that I’ve found the hardest to leave behind (don’t worry, she’s in capable hands). As said, the area surrounding Santa Marta and Rodadero is nicer than the cities themselves. We would have loved to base ourselves out of there instead. But it would have been hard, to put it mildly. In large part, that was down to the internet. The moment you leave the city it slows to a crawl. Power outages are also a bit of a problem. I’ll detail the places we visited. Some were better than others. Note, there are lots more, but as we didn’t go I don’t feel I can comment on them. Minca would have to be about the only place from which you could still base yourself for a while. It is half an hour away from Santa Marta and though it didn’t have a supermarket the food on offer there was fantastic. It had lots of vegetarian options too, which made my girlfriend dance a jig. You see, most Colombian’s idea of vegetarianism is to eat the salad that comes with their meal. (Even by that definition, most Colombians still don’t qualify). We loved Minca. There is some beautiful nature around and you can wander through valleys dotted with waterfalls, rivers, and little lakes. The view from Casa Loma was particularly fantastic. That’s probably why they got mentioned in National Geographic. Note that there is no cash machine. So take plenty with you. This is, in fact, true of all the places. Of course, you can set up in Santa Marta and Rodadero and then go up to Minca when you feel like it. Both ways around works fine due to how close they are. Tayrona is a national park that runs along the coast. 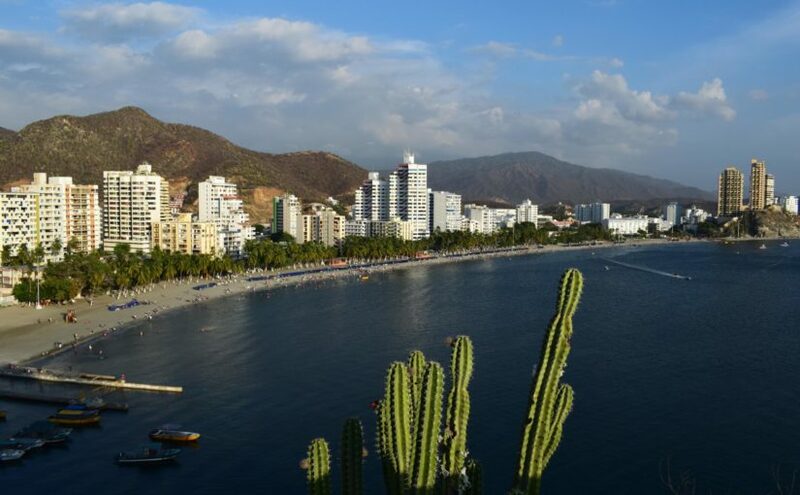 It’s in all the guidebooks and is the first place most people will mention when they talk about Santa Marta. We went for a one-day walk there with a guide. Normally we don’t use guides. We shouldn’t have this time either. He took us on the same route as everybody else and he didn’t tell us anything. So why the hell was he there? We could have followed the (hordes of) other tourists! The park itself was beautiful. There were a whole bunch of different landscapes, with each worthy of a clichéd film’s happy ending. But as we often had to wait for five minutes to clear of tourists enough so we could take a picture, we felt a bit cheated. What we should have done is gone in and spent the night. There were tons of tents and hammocks for rent in the park. And as most people are day trippers, that would have left us with the park to ourselves in the evening. Note that if you follow this route, take provisions. They try to rim you in the park itself. If you take the bus from Santa Marta market it will drop you off right at the park’s front gate. Note that the bus isn’t air-conditioned. So go early or late. Taganga is where we started our Santa Marta adventure. We’d been told it was stunning by other digital nomads. Maybe we arrived at the wrong time, but we were not impressed. Admittedly, with La Nina just past it was drier than it usually was (this was true of all Santa Marta) but we thought it was hot, brown and dusty. I guess if you want to get high it’s a good place to go. We were offered all kinds of drugs on the beach. It has a colorful history of drug smuggling. The thing is, people offered us illegal merchandise in Santa Marta and Rodadero as well. So I don’t see why you would want to go to Taganga for that. 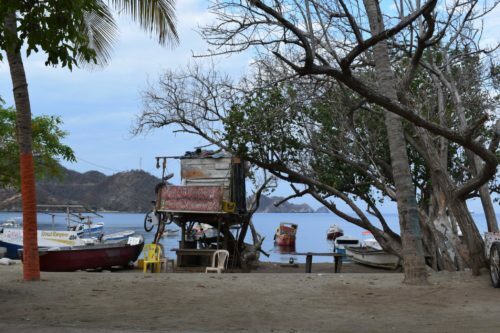 Also, while you could swim in both Santa Marta and Rodadero, in Taganga you’re going to keep smacking into fishing boats. It’s a fishing town, after all. So no, I don’t get what the fuss is all about. If you do, please do let me know. Palomino is one of the most beautiful beaches I’ve seen in a while. It’s swaying palm trees abutting sand and sea. There isn’t a lot of construction on the beach yet. Maybe there will never be. Perhaps the locals or the government has decided they’d rather keep it pristine. We can only hope. Most of the hostels and hotels are away from the beach, closer to the road. There is a selection of different foods and places to stay. It was a mixed bag in terms of quality. One of the big draws is the nearby rivers. They offer inner tubes for rent and you can float all the way down to the sea. That’s a pretty awesome way to relax. You can also go for long walks in the surrounding countryside. As it’s not that crowded, you might actually prefer this to Tayrona. Another advantage, of course, is that you don’t have to pay to get into this place. You can get here from Santa Marta on the bus in a little under two hours. Again, you need to go to the market. It’s the same bus as goes to Tayrona. I didn’t mention one of the biggest reasons that people go down here and that is the lost city trek. It’s because we didn’t do it. I regret that as people have told me it’s as good as Peru, but then without the crowds or the high entry fee. It is a several day hike. So be aware of that. Don’t go in April and May. It is hot. And I’m not some pansy saying that. I’ve traveled through a lot of hot places and never felt bothered. Here I did. It was annoying as it limited our options. Basically, they were ‘stay inside’ or ‘have the sun go after you like some kind of psychotic killer’. The heat was already intense from 9 AM onwards and didn’t abate till about 4 or 5 PM. In the middle of the day it got so intense that even the water tanks on the roof warmed up (can anybody explain why they make those black?). That made showering after 11 AM a lukewarm experience. They say the months preceding these two are much better as there is a constant strong breeze that comes down from the mountains. But any time will do as long as it is not April and May. And finally, though we don’t regret our stay, two months was on the long side. I think a month would have been better. You can do each of the things I’ve mentioned and the lost city tour in that time and still work a full work week. Though of course if it wouldn’t have been so hot we might have felt different. So that’s Santa Marta (and Rodadero). Definitely great choices if you want a place to settle down for a while in Colombia which isn’t Medellin or Cartagena.